SO.....can anyone recommend a place? I have never been to an all-inclusive, so I have no idea which ones are good. HELP ME! Have you looked into Sandals? We've been to a few of their locations in Jamaica and they meet all of your requirements. We usually spend $3,000 for a week there, including airfare. My husband and I did the Sandals Grande Antigua all inclusive. SO ROMANTIC, gorgeous, and well worth the money! The weather was great (we went in April) and the beach was fantastic. Good food, good nightlife, FABULOUS room! We went to Jamaica. Place was called Couples located in Negril. Very nice and a lot of fun. Was our first trip like that we loved it! Was nine years ago so not sure it's still as great but you should check it out! a few years ago we went to the dreams puerto vallarta resort and it was amazing! i got unexpectedly pregnant with my daughter, if that tells you anything about the ambience. ;)ours was paid for by my husband's company, but i am pretty sure it is rather affordable. We went to the El Dorado Seaside Suites in Playa del Carmen. We had a swim-up room and it was fantastic! Girl Sandals is the way to so, my husband and I did Jamaica there, and it was amazing! Sara, I've never been to an AI, but I was going to recommend doing some checks on Trip Advisor when you have recommendations to see the latest scoop on each place. Last year my husband and I went to Puerto Vallarta... stayed at Dreams Resort and had a great time. It's a kid friendly resort, so I wouldn't recommend it for honeymooning. But PV is an amazing destination. My in-laws always go to Playa Del Carmen and LOVE it! Not sure of the resort though. Well, I can't speak from experience since we never go on vacations, but quite a few of our friends have been to Sandals and/or Couples in Jamaica and they all had nothing but great things to say. You probably can't go wrong with either one! We just did our honeymoon at secrets maroma beach in mexico- it was beautiful! and i loved every minute of it! they had a night club for dancing every night and the beach was fabulous! PVR PVR PVR!! Nuevo Vallarta resorts are great, we like Paradise Village area, cab to the clubs, might not be adult only? Oh Sara, you're on the right track, just head 20 minutes towards the beaches from Puerto Vallarta to Nuevo Vallarta - it's not as busy as the city of Puerto Vallarta (but close enough to go back and do a day touring the artsy area). We stayed at the Riu (an all inclusive chain) - it's all inclusive and they have liquor distributors in every room and a mini fridge of beers, sodas, snacks, etc (also ALL included). It's not adult only, but when we went (toward the end of January, in 2009) I saw NO signs of kids (it was our honeymoon too). AND, the resort was only about at 40% occupancy b/c the economy had just tanked. So it was us and a bunch of Canadians so friendly & fun. It's Riu Palace Pacifico (built Oct 08) and there are 2 others within walking distance (Jalisco and Vallarta). TThe Palace Pacifico is the top of the line and therefore we were able to enjoy the amenities of the other 2 (food, pools, bars, night club, etc. )for free. The rooms were very beautiful and it was super fun. Let me know if you're interested and I'll invite you to view my Snapfish albumcount which has a ton of pics of the place (including the restaurants which are also included in your stay - in addition to the huge dining room you also enjoy everyday). You can also zip line thru the rainforests (and where they filmed Predator w/the props still intact). There's also a spa. We had a great couples massage. We paid around $3K for flight and hotel package using USAir Vacations and then got an upgrade when we told them we were honeymooners. Can you tell I'm totally excited talking about it!! I recommend the Caribbean. We went to Nevis and loved it (own private pool, cabin, and 180* views -- yes please!) but it doesn't match any of your qualifications minus the fabulous beaches. I've heard good things about the Sandals in St. Lucia. Excellence Resort in Riviera Maya Mexico! AH! Didn't know you were about to get married so soon- CONGRATULATIONS! We went to the Aventura Spa Palace in Riviera Maya, Mexico and it was INSANELY WONDERFUL! Here's the link: http://www.palaceresorts.com/Resorts/AventuraSpaPalace/. Good luck with your hunt! We went to the British Virgin Islands and stayed in a hotel called the Long Bay Beach Resort. I don't know if they do all inclusive but I know they do a dinner bed and breakfast rate. There were a few children there when we were there, but not masses, just so long as you go when school holidays aren't on. But also have a look at other hotels in the Virgin Islands, it is so beautiful and very romantic!! Highly recommend Dreams PV! We went last May and LOVED it! There are kids, but they're more or less contained in the kids zone or whatever they call it, so I didn't even really notice them much. We were worried about the crime in Mexico, so we went to Montego bay, Secrets resort in Jamaica. They're the same company as the Dreams resorts I think. Might be more than your 3k though, you have to look for deals. You can search a site like All Inclusive Outlet or Cheap Carribean though, and you can even tell it you only want adults only, all inclusive, etc. We really liked Secrets; I wrote about it a lot on my blog back in July. Would you consider a cruise (on a premium cruise line)? Crusies are all-inclusive and you get your beach days (and a relaxed itenerary if you get to stay overnight at a port). My husband and I love cruises and we're not old. I know you want Mexico and you could leave from Southern CA and get a cruise there. Or, if you are flexible I suggest Bermuda. It's not in the Caribbean (technically, it's the Atlantic) and it's safe, clean, and somewhat isolated. Most cruises that go there offer multi-days at one port since the islands are so far from civilization. Another one chiming in for Sandals in Jamaica (Ocho Rios). One thing we liked about Sandals is you could take a shuttle from one Sandals to another which was nice to change up the scenery and up your restaurant options (in Ocho Rios we had three Sandals to shuttle to). It was absolutely beautiful there! The only excursion we did was hike Dunns River Falls and that was so much fun! We chose a suite that over looked the mountain instead of the ocean and again it was so nice to have that change of scenery. Here are my negatives: only beer is Red Stripe (I tend to enjoy beer more than liquor so it was hard ordering drinks since I don't know the names of many mixed drinks--I kept ordering a drink called the Hummingbird and it was so good (but rich). And second, the food. It wasn't bad but the menus don't give a detail description so my orders were never what I expected them to be. If I could, I would go back there in a heartbeat! I think all-inclusives are the way to go for the honeymoon--it's so nice to fully relax after a whirl wind of wedding planning. I've been to RIU resorts in the Dominican, Cancun and PV. They are all pretty and a really good value. The ones in the DR and PV skewed toward an older clientele, but then, I do love old people and a good daytime buzz :) So I fit right in. Cancun was definitely more of a young party party crowd. We stayed at the Moon Palace in Cancun for our honeymoon (oh so many years ago) and it was all inclusive and FABULOUS. Not sure that I'd go to Mexico right now though, but I have friends who swear that the Virgin Islands are the best. Good luck!! So I've only done one all-inclusive (Jamaica... it was okay, but not my fave) but I've visitied a number of the Caribbean islands-- Jamacia, Bahamas, Turks & Caicos-- and my favorite by far were the Cayman Islands. I don't know if they have all inclusives, but I would definitely check it out. Whereas Jamaica and the Bahamas had some "bad" areas... I remember the Caymans being nice all around. Great scuba diving if you're in to that! Also, I fully expect you to post a few wedding pictures when the time comes. Oh wow- I wish I could be of help. I'm just going to bookmark this page and refer back to it and all of the helpful comments you're getting as my own honeymoon planning commences. Good luck!! We went to Sandals in Montego Bay, Jamaica. It was fantastic! The cool thing about Sandals is that when there are more than one Sandals resort in a city, you can go to the other one(s) for free to enjoy their food and nightlife too! Last year we stayed at Cancun Palace in Cancun and it was FANTASTIC!! It's an all-inclusive and the decor is modern, the service outstanding and I'm going back for more. The best part about it is that the palace family of resorts have around 10+ hotels around the Cancun, Cozumel, Playa del Carmen, and Riviera Maya and you can go to any of them during the day for breakfast lunch or dinner. So if you want to go sightseeing you can save even more (on meals) and take advantage of their hospitality. You can use all their facilities but you have to go back to your original hotel to spend the night. I highly recommend them. Depending on the Palace hotel you choose, the decor varies but the service is the same in all of them. Oh gosh, I just re-read my comment and totally sound like a commercial but I was really happy. Either way, I wish you guys the best and have fun on your honeymoon!! Iberostar Grand Paraiso in Mexico. We aren't the "all inclusive" type... we are food snobs and like to explore. We didn't much want to leave this place. And, the food was pretty good. Ignore the reviews that say the French and Italian places aren't that good... these people clearly don't know food and must think Olive Garden is good Italian food. Not dissing OG, because I like it sometimes too, but it is NOT good Italian food. Palace Resorts - locations in Puerta Vallarta and Riviera Maya (and others) but those are the two that we've been to. We got married and honeymooned at Moon Palace in Riviera Maya - and it was nice because it was an adults only all inclusive. However, the beach scene was limited because of the rocky beach. 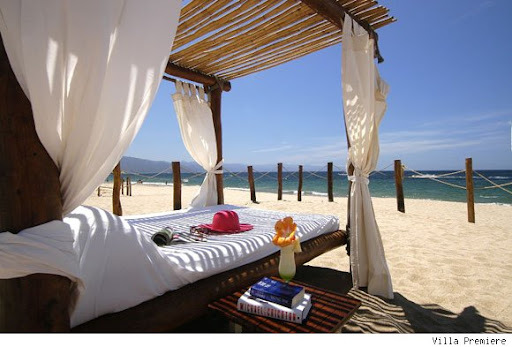 Puerta Vallarta was lovely with great beaches and a super classy resort. We aren't much for nightlife, so I'm not sure exactly what they had, but we loved our Palace experiences! Best of luck! I think the price was around your budget, but I'm not 100% sure because our honeymoon was a gift. Things to keep in mind when picking an all inclusive: Look for places that change their menu daily and/or have a lot of restaurants. Our resort won several awards for the food, but if they hadn't had as many restaurants as they did, then I would've grown tired of it pretty quickly. Also, if you can afford it, then try to stay in a nicer room in a nicer section of the resort. Peter and I stayed in a casita at the El Dorado and most of the other people around us were quieter couples who were on their honeymoon or a romantic vacation. When we walked to the other side of the resort it felt a lot less romantic and more like spring break. There were a lot of groups of guys and groups of girls all getting wasted, screaming, and trying to hook up. For us it was also really important to stay in an adults only resort because we didn't want little kids doing cannon balls while we were lounging at the pool. This decision, in addition to the importance of good food, really guided our decision in where to stay. Katie and her hubby from Bower Power stayed at the same place for their honeymoon. If you look at her wedding recap from this past year she posted some really great pictures. How exciting that it's only 4 months away!!!! We are big beach people, but never done an all-inclusive, so I can't help there. We loved the beach at Playa del Carmen, Belize, St. John, and Negril. Riu Resorts rock, they have locations all over the Caribbean and Mexico. I highly recommend them! We went to the Excellence Riviera Cancun for our honeymoon last September and it was ah-mazing. Adults only, all-inclusive, gorgeous hotel, great beach (with beds!) and amazing food. They also have shows every night that are very entertaining (the Michael Jackson show was our favorite). We didn't have to leave the resort to have a great time, but we did do a day excursion for a zip lining/Mayan ruins tour--so fun. We highly recommend it and are looking to go to other Excellence locations it was that good. Have so much fun! I've stayed at all the resorts mentioned by the other posters and agree with a number of them. Eldorado Royale and Seaside are both great adults only and a la carte all inclusives. I particulary like a la carte because I'm not a big fan of buffets. The Royale (as mentioned) has amazing casitas (suites); there are 2 levels: one with a lazy river running out front which I would highly recommend the main floor (both top and bottom floors have out door showers and decks with big beds to lounge on) but I prefer the main floor; open the door and step into the lazy river complete with 2 lounge chairs in the water. heaven. The second section of the casitas (which is newer) are the casitas with infinity pools....I'd recommend the 2nd floor; swimming in your pool overlooking the ocean is very relaxing. In both casita areas, you get private palapas on the beach (that the rest of the resort can not use), they bring you lunch in a bucket (why leave the beach?! ), constant bar service AND suntan lotion & magazine service. The Eldorado Seaside is MUCH smaller than the Royale (& the Royale Casitas has a freaking amzaing spa/gym/relaxation area that you can use free of charge...) Anyway, The Seaside is nice too but smaller....but just as good! (no casitas) & it's a little further from Playa Del Carmen but still a short taxi ride. The Aventura Spa Palace is good too...BUT they divided it from adults only to 1/2 adults only and the other 1/2 is for families. ugh. I don't want to be around other peoples kids on vacation. BUT they do have THE BEST SPA I have EVER been to in the Mayan. Hands down. All of the Palace hotels are okay but it comes down to personal preference. Personally I really dislike the Cancun Palace (it's a family hotel with buffet dinners & not the best food AND it's in Cancun. blech). The Moon Palace and the Playar Palace in Playa Del Carmen are a little better (still for families and buffets but with more amenities nearby). Huatulco, Mexico was WONDERFUL!!! It's a bit different than your Cancun & Carribean destinations, not so touristy. We LOVED it for our honeymooon! We just looked into this exact same trip and had a hard time finding a place that caters to adults only with a beautiful (ie, not rocky) beach and good reviews on TripAdvisor.com for around $3500 for a week but that might be b/c we'd need to fly from SFO or OAK instead which always adds $ to Caribbean destinations. Based on cost, location and reviews the places I had put at the top of my list were Secrets Maroma, Valentin Imperial Maya and The Royal. I'd read pretty negative things about the other two Secrets properties in Riviera Maya. We celebrated our 8th wedding anniversary at Couples Sans Souci in Ocho Rios Jamaica and paid $3200 for the week (including airfare). It was beautiful and amazing and we just loved the property and the service so I always recommend it when I get a chance. Okay - it's not Caribean or Mexico - but check out Casa Marina in Key West. We just got back from Key West and I freaking LOVED it. The beach is 1/2 block from Casa Marina, there are GREAT restaurants, and actually lots of fun things to do.I'm going to post a little bit about our trip soon, so stop by! I did the Sandals in Antigua with an ex-boyfriend. I'd recommend. Get a presidential suite, though. I wouldn't do the Bahamas. So what did you decide on? If not yet decided, check out Aventura Spa Palace in Puerto Aventuras South of Cancun Mexico.